Two piece ceramic pitcher and basin set. Basin 16.5"D x 5"H; Pitcher 9"W handle to spout x 13.5"H.
A Secessionist style ceramic wash basin and pitcher, circa 1900. 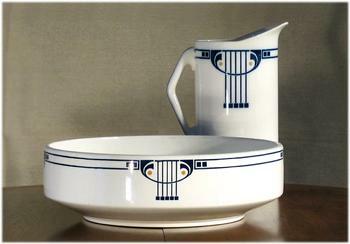 Large wash pitcher in white with blue linear decoration accented in yellow, accompanied by a large basin with conforming decorations. Excellent original condition, with chip to bottom of basin and light cracklature to bottom of basin, also as shown. Strong and substantial feel; heavy and large.